Sphygmomometer is an instrument which used for measuring blood pressure. This is typically consisting of an inflatable rubber cuff. This is applied to the arm and connected to a column of mercury next to a graduated scale, enabling the determination of systolic and diastolic blood pressure by increasing and gradually releasing the pressure in the cuff. This reduce trips to the hospital to check the blood pressure. 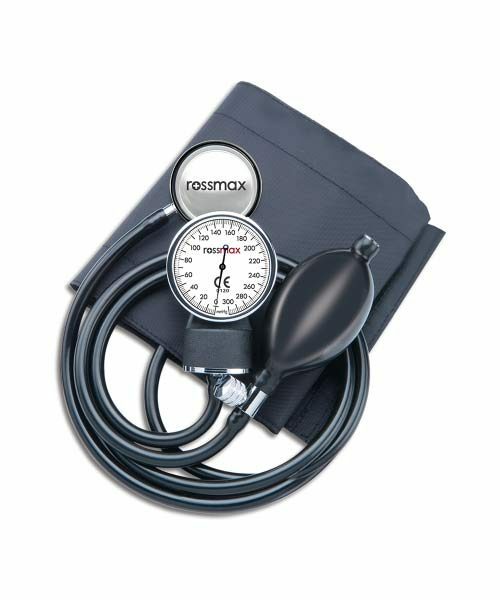 This aneroid sphygmomanometer from Rossmax and check your BP at home. It is a palm type syphgmomanometer. This is light in weight detachable single head stethoscope. This have Chrome plated brass air release valve. This device give accurate results. This Chrome-plate brass air release valve. This is Latex free Cuff. This measure the blood pressure in the range of 0 to 300 mmHg. The latex-free nylon cuff fits your upper arm and helps you take accurate measurements. The bulb and chrome-plate brass air release valve let increase and gradually release the pressure in the cuff with ease. This BP monitor features have professional design and comes with a single-head stethoscope and can be used by doctors.